Baca, revealed their exciting new concept for a revolutionary racetrack design in 2014 and have been working with engineers Royal Haskoning to evolve the construction methodology. 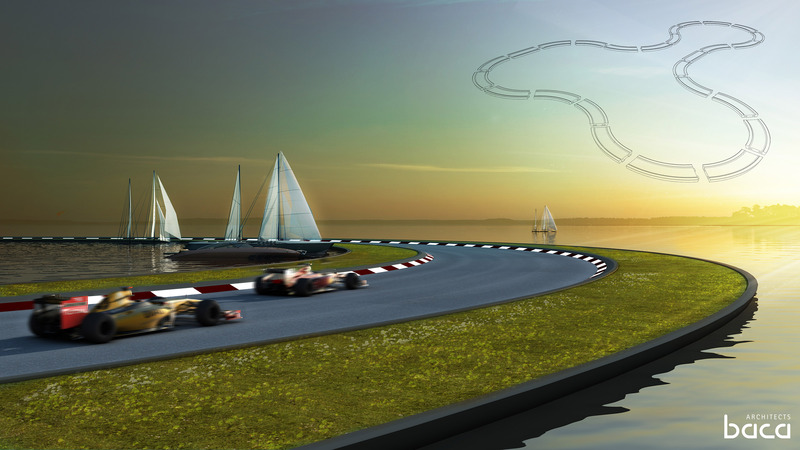 The proposed circuit, pits, grandstands and accompanying eco-leisure resort will all float on the surface of the water, providing a unique racing experience for teams and spectators. The innovative design of the structure would permit the course to be dismantled into transportable sections, allowing the track to be leased to various different destinations for periods of time. This extraordinary track would be complimented by an extensive marina, floating hotels and facilities. The model of a mobile racetrack and accompanying complex opens the possibility of hosting grand prix and other motorsport events to many more countries with international waterfronts around the world and would adding a fresh global dynamic to racing.